KUNENE, Kenya, Dressed in brown overalls, gumboots and a hat, John Njeru kneels and scoops up a handful of soil at his small farm in central Kenya, where he grows tomatoes, spinach and carrots. Dealing with more unpredictable and irregular rainfall associated with climate change is a challenge for many farmers, and one made worse by water-wasting, inefficient irrigation systems, experts say. But scientists from Kenya’s Meru University of Science and Technology have come up with one way to deal with the problem: a mobile app that monitors the need for water in fields and controls irrigation equipment to deliver just what is needed. “Farmers in the region traditionally water crops with cans or buckets”, an inefficient way of getting water to plants, said Daniel Maitethia, an electronics lecturer at Meru University. “The lack of measuring also means they water crops unevenly – so some may get too much water, and others not enough,” he said. The “sensor-based automatic irrigation system” app, launched last year, uses senors placed throughout a field to determine if soil is moist enough. If it’s too dry, a control unit uses solar panels to open the valve of a water tank, then close it again when the soil is damp enough. Initially tested at the university’s own farm, the irrigation system is now being rolled out to the public – including farmers like Njeru. “We can’t yet quantify how many farmers are using the app, but hope to expand it to thousands across Meru County – and potentially the rest of the country if the system proves successful,” Maitethia said. 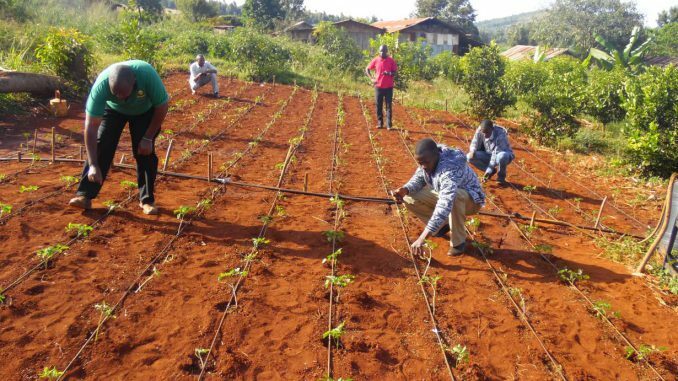 The combined app and irrigation system cost 50,000 Kenyan shillings ($480) per quarter of an acre, including solar panels and two drip irrigation lines. The system can be expanded to an additional quarter acre for 5,000 Kenyan shillings ($48). While Maitethia acknowledges the upfront cost of the system is high, he believes it will not only curb water waste but save labour costs as it does not require farmers to physically monitor it. Depending on the severity of the problem, a consultation with a technician can cost the farmer up to 500 Kenyan shillings (about $5). “I used to lose up to 70 percent of my produce as a result of dry weather and inefficient irrigation, compared to only 10 percent now,” he said. Njeru used to occasionally hire other farmers to help water his farm on a day-to-day basis. Now he no longer needs to do so, he said. “That saves me 20,000 Kenyan shillings ($192) per month,” he said. Maitethia thinks that as more people buy the app, its cost could reduce by more than half. The project was awarded 1 million Kenyan shillings ($9,600) by the Water Services Trust Fund in November as the best innovation in water management, he said.